Tips to Customize Blogger Template. ~ The Blog Doctor. You are here: Home > Template > Tips to Customize Blogger Template. 1. Body - This is the whole of the page within your browser frame. In the diagram below it is the area within the thick red border. It contains everything on the page including the Blogger Navbar at the top. 2. Outer Wrapper - This is the container which contains all the sections within your blog. In the diagram it is the area within the pink border. This may be represented by another name in your template. 3. Header Wrapper - This is the top section and contains the Header. Inside it is the Title and Description of the blog. The orange and yellow borders in the above diagram delineate this region. 4. The Main Column - This contains the posts column and is usually the widest. It may have one or two sidebars alongside it. It is shown by the blue border. Inside it is the posts section. Notice that the date and the feeds ( Subscribe to Posts Atom) are not inside the posts. 5. The Sidebar/s - They are at the side of the posts column. Notice that the sidebar does not extend right to the foot. It extent is determined by the content within it. 6. The Footer - This corresponds to the header but lies at the foot of the page. Normally all these sections appear contiguous unless they are in different colors or have borders. When you want to add a third column to customize the template you can easily get confused as to whether it has been added or not? The remedy is to add borders to all the sections so that they can be better visualized. You can remove the code for the borders after finishing the customization. Then add the code line for the border as shown in red above. Preview and save Template. This is a very useful trick when you want to change the width of your blog as it shows you exactly where the blog is on the page. Whenever you add a new sidebar section add a border line to it just like above. This will help you to "see it" on the web page. Always remember to refresh the cache after saving the template or you may end up looking at an old cached copy of the page. You can also add a picture/image in the background of any section. NOTE : The above sections in your template may be called by different names. The code may also be a bit different. Just to let you know I've added this blog to my favourites in Technorati. A big thankyou from hardworkinghippy! Thanks for asking. I have added you with pleasure. I saw your post on my blog, and you said you would favorite my blog if I favorited yours. Well, I did add yours to my favorites. Thanks! I have favorite you all. My toggle for Archives has changed color in the last few days - it seems like the color of Text for main posts is duplicated for the toggle arrow. I want to change it from black (the color of my text for posts) to white (the color of my links). How to change the toggle color? What is your blog url? For detailed help use my email address in the left column. Sorry if this is the wrong place for this comment; I'm grabbing all straws. I remember getting your help previously, but not the for what. I did a few things trying to edit the template html. I'm quite sure I didnt save the changes. I also installed Firefox and tried editing template html in that browser. Cant remember if I saved changes. Suddenly, could only get a thin red strip along top horizon on screen. Strip was due to a long ago hack to widen the header. Blogger Help in email response advised me to check out Groups and Bloggerhelp. The blog's not "lost" I think if you click on http://thislittlereddot.blogspot.com; you just get a thin strip of red. Can you please help me to get it back? ps: I'm not signing in under Google/Blogger as I have a few id's and don't want to complicate/lose this comment as I most time get mixed up with my ids and passwords and email addies; am using my most frequently used addy. Guess you will have to reload the template or choose another new template. Go to Template----->Pick New Template. Thanks - I'll try it when I get back onto my own machine. You've got a great weblog, and so far I've made valuable use of your tips and tricks. Thanks again! Finally, a diagram to show what element is what. This is magnificent -- thank you! A picture is worth a 1000 words, and in this case it's worth 1000 hours of painful trial and error for a very inexperienced blogger. Thank you for your blog which is so helpful. However I still have a question: Using a "Rounders 4" template, I can change the background color of the main column and of the sidebar but I don't find how to change the background color of the blog body (between the red and pink borders in your figure). Thank you for a help. Change the "bca" to any hexadecimal number of any color you prefer. hey man..thanks for all of the great tips... I havve a question that you seem to be ale to help me out with. .. Any chance you might know why some of my posts end up with scattered here and there throughout the text? Is it something in my encoding? Any tips you might have would be greatly appreciated...thanks again! I have tried to change the background to ffffff (or any other colour in case it was transparent) but it doesn't work. hey thanks for the help Vin. everything worked out good besides I can't see the collumn I added. I tryed putting stuff in it and everything. How do I add spaces to the "list" element? My links are running together and I need each item on a separate line. I just don't know the code for adding a line break or whatever it might be. Check that the number of your LinkList element is 1 from the unexpanded widget template. Preview to change '4.5' to a lwer or higher figure. Then Save Template. Both these are preventing the background image from loading also! 1st... I love your blog! This occurs when you post something in your blog which is too wide for the column size like a big picture or URL. Try removing them and clearing cache. 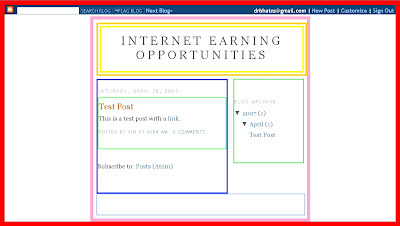 Or else you will have to increase width of blog.
? for ya. How do I move my footer down so that there is a space between the bottom post and the footer? Or, how do I make the "older posts" section smaller? Thank you. www.oliviamariecaldwell.blogspot.com Thanks for taking a look. Interesting. I have Firefox and there is no space. I will just leave it. hi, could you teach me how to delete the upper part of the header? the one which says, Next Blog. I would like to delete it. pls help. Have a look at Navbar in Blogger. Could you give me some guidance as to how I do that? Also, I don't have a google page account, and they aren't letting anyone new join. Do you have the picture ready? Is it a small picture you want to tile all the way to the top? Or is it one big picture? Do you want a frame of the same picture OR of different pictures? You will have to use Photobucket.com to upload picture to. It is a series of little pictures that I am trying make into a border for our blog. I will try photobucket. Btw, you have a great site and an excellent technophobe friendly style of explaining things. I have had no luck getting my little different pictures up, although I did manage to create a lime green border I didn't want and can now not get rid of!!! I have tried to follow your instructions for the pictures, but have had no success, in fact, at one point, I only succeeded in wiping my blog! Any words of wisdom? Change 2px in border line to 0px and Preview and save. Thankyou for the help with the green border, it worked like a charm. Could you give me any help with getting my border of little different pictures on my blog? I keep trying to replace a widget on my sidebar I lost when changing templates. the code isn't right. I add, delete, etc. and still can't add the widget. Could you kindly tell me how I should correct/add my sidebar widget? The type of the widget. The code you are pasting and where? is there a piece of code to do this? First you will have to remove the Blogger navbar. It's so nice to follow your site. Thanks also for those tips. but i like to have some spacing in between the borders and the text/widget. Thank you for yr wisdom tat i manage to add a third column. Current I have add a border on the sidebar but the words and border are squeeze. Any ways which i k leave some space btw the txt/widget and the border? Hope u k help me with this. How do i add a wigdet between the banner and post.? Use the padding-left or margin-left in the CSS part of the template to add space. You can also use padding-right or margin-right. Those are good notes for a beginner. Visiting this kind of blog helps us a lot. I hope I could learn more from your posts. hmm wow this site is really awesome and informative to me, i am also gonna share this site to my friends.